The domain seizures by the U.S. Government have hit a new target, and it’s without a doubt the biggest fish thus far. Three of the largest poker sites – PokerStars, Full Tilt Poker and Absolute Poker – had their domains seized today as 11 people connected to the gambling outfits were charged with bank fraud, money laundering and illegal gambling offenses. The indictment (pdf) was released by the U.S. Attorney’s office in New York Friday afternoon reveals that the seizures are part of a FBI investigation. 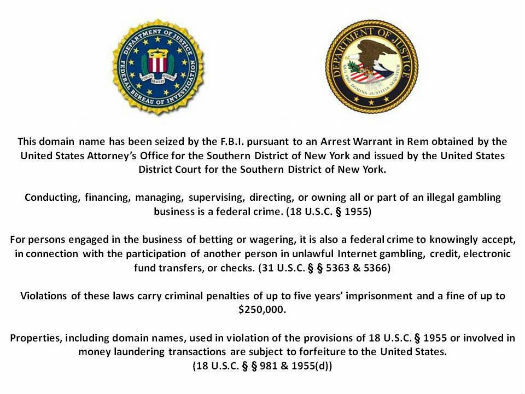 “As charged, these defendants concocted an elaborate criminal fraud scheme, alternately tricking some U.S. banks and effectively bribing others to assure the continued flow of billions in illegal gambling profits,” said Manhattan U.S. Attorney Preet Bharara. FBI Assistant Director-in-Charge Janice. Fedarcyk chips in with a comment on the news as well. “These defendants, knowing full well that their business with U.S. customers and U.S. banks was illegal, tried to stack the deck. They lied to banks about the true nature of their business. Then, some of the defendants found banks willing to flout the law for a fee. The defendants bet the house that they could continue their scheme, and they lost,” she said.